Charles F. Beatty, is the town's namesake despite the slight change in spelling. Beatty arrived in what would become Beattie around 1892. The 20th Century arrived to find Beattie with the essential businesses of grocery, drugstore, barber and cotton gin - but no railroad. 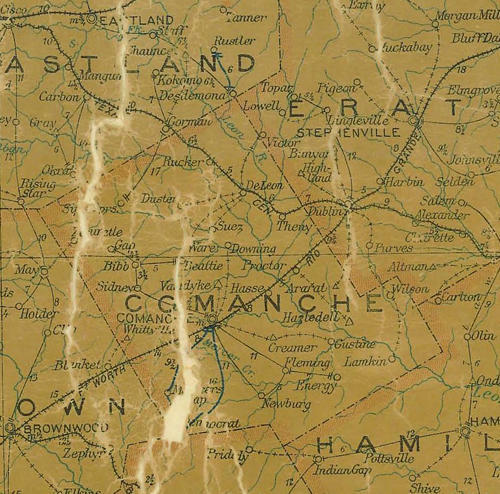 If one needed a doctor or sheriff, one could call Comanche (City) by telephone. The post office (frequently to blame for misspellings of town names) was only open from 1902 to 1908. 1930 is the town's population high-water mark when 150 people lived there. By the time WWII ended, it had lost half of its businesses and 2/3rds of its 1930 population. 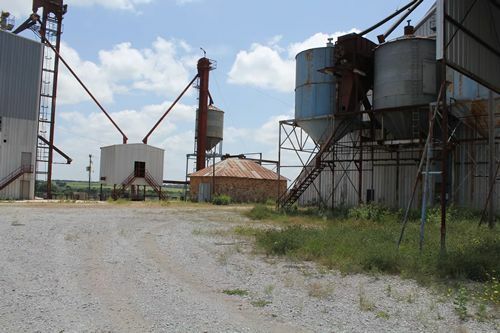 By the late 1980s there were no businesses in Beattie and the population estimate has remained at 50 for the last 60 years. This bare-bones history is supplemented by Remembering Beattie, Texas a richly detailed personal account of Beattie written by Harland Moore - the man who provided the entertaining and equally detailed history of Bend, Texas. Columbus discovered America in 1492 but I discovered Beattie in July of 1936. My Dad had previously contracted to top-work some pecan trees for John Scott and his brother Pink Scott. 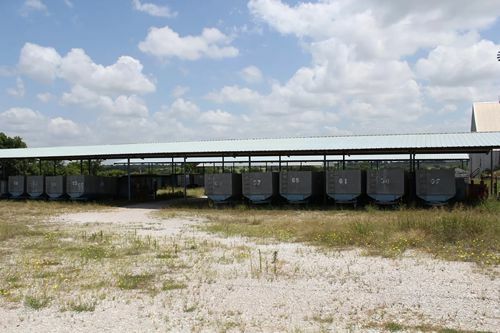 Their native pecan timber was located on Copperas Creek about two or three miles north of Beattie. Daddy had started the contract work on these large native pecan trees the previous winter. He and Thomas January had topped or "dehorned" these trees with a cedar ax and a one-man cross cut saw. The larger trees did not have any limbs small enough to put buds on the first spring. After they were topped, young sprouts would put out and start growing all over the trees. By late July or early August these sprouts had grown enough to be thinned out and budded with "bud-wood" from some paper-shell pecan trees. At that time, we used mostly Burket, Mayhan and Delmus varieties. Daddy, Thomas January and I were on our way to the Scott place to do some summer budding when I got my first view of Beattie. 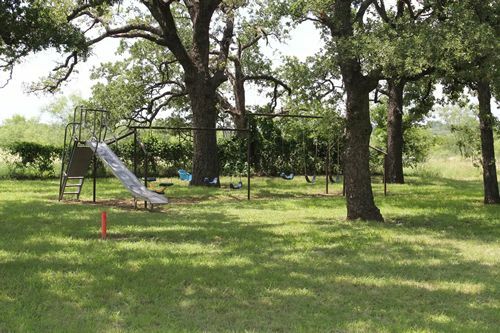 At that time we lived at Bend, Texas, and since it would take two or three days to do this phase of the job, we had packed our tools, bud-wood and camping equipment on Daddy's pick-up truck. That pick up was only a couple of years old but they were not too well built then. The back half of both rear fenders had already vibrated off, leaving the rear wheels almost totally exposed. It didn't bother much until you got in the mud. Then it would sling mud high into the air and it would fall all over the cab, bed and hood. That was the dirtiest truck in Comanche County at that time and there was very little pavement. We were lucky that it was not raining at that time or everything we had in the back of the truck would have been covered in mud. 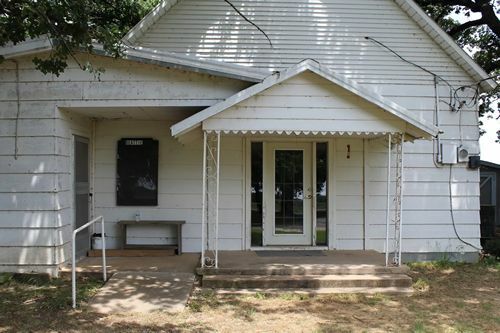 As we drove through Comanche that afternoon, I saw some things that I remembered when I had visited Grandpa and Grandma Moore in previous years. We drove north on a street that Grandma and Seth and Raymond used to peddle fruits and vegetables on. We drove on north on a dirt road. In places there were dried ruts through the clay as a reminder of previous rains. After the ground had dried the cars started straddling the old dried ruts and made a new set of tracks that were not so rough. This worked fine until you met a car from the opposite direction in the same set of tracks and both vehicles had to move over. This was a slow but rough process when it was dry. Some times it was almost impossible to move over out of the ruts when it was wet and raining. The road ran in a north or west direction most of the time with many sharp turns and corners as it made its way by the many sandy land farms. In some places the road went through some deep blow sand and even the most experienced drivers would have problems driving through dry sand. We crossed Sweetwater Creek and went by the old Sweetwater Store. We then worked our way north and west and went by Taylor's Chapel and Concord Cemetery. We crossed Martin Branch and went by the Louis Nelson place and on up to another corner where Bert Frazier lived. We passed by Will Frazier's house at the top of a rise. We then went down a slope by four or five dwelling houses and two church houses. We crossed a branch on a culvert made of bridge planks and found ourselves sitting in downtown Beattie. The country road that ran north and south through Beattie was in poor repair. It was full of ruts left over from the last rain. In places it had chug holes as big as a wagon bed with loose sand traps here and there. There were a few small spots of gravel and adobe dirt in the road that had been put there by the road commissioner just before the last election. On the west side of the road there was a general store called Blair's Store. A little north of that was a blacksmith shop operated by Uncle John Kelley. I think at that time Dan Bingham's barber shop was on that side of the road. (It was a small building and he moved it two or three times on either side of the road.) There were two or three dwelling houses on that side of the road, including Cousin Kitty's house. The East side of the road had two service stations with grocery stores in them. One of these stores bought produce such as cream and eggs from people that farmed in the area. There was also about four more dwellings and a church house on that side of the road. At one time there was a garage which offered auto repair and gas and lube. 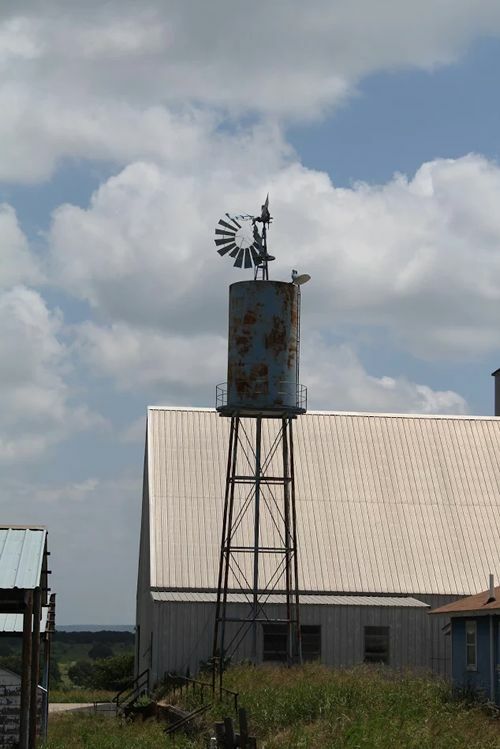 At one time there was a cotton gin which operated in down town Beattie but at that time only the old earth pond called the gin tank was the only visible reminder of the cotton country before the bole weevil. About a hundred yards south of the Beattie Branch there was a dirt road going east. John Andress and Dan Bingham lived a short distance down this road. A little farther down the road, Aunt Polly and Aunt Ruthy Butler lived to be about a hundred years old. 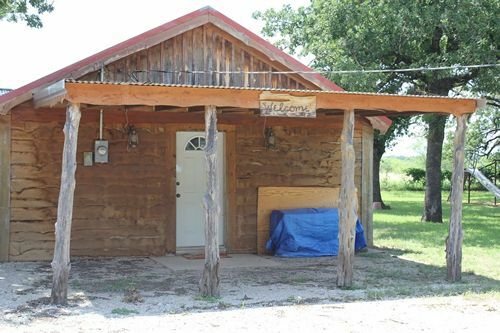 Elmer and Boyd Butler lived near by and Roy Butler moved from there to De Leon later. 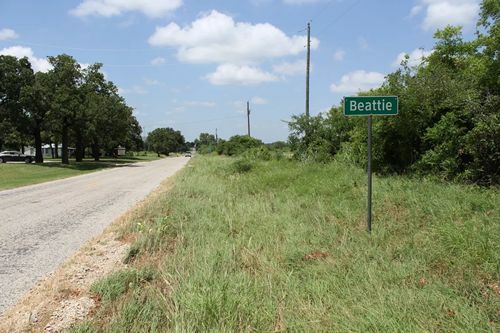 The road that ran west from Beattie went by Jim Wright's house and another house just across the road. If you went on west on that road you would come to the old Carter place and Egbert Teague's place. Just a little farther up was the Auvenshine place and the George Moore place. 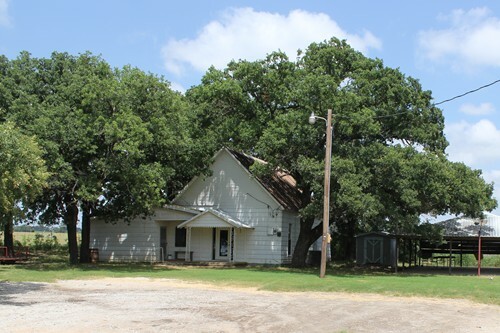 Located north of downtown Beattie was the two story school house which was just across the road from the Halbrooks place and not far away was the John Welch place. 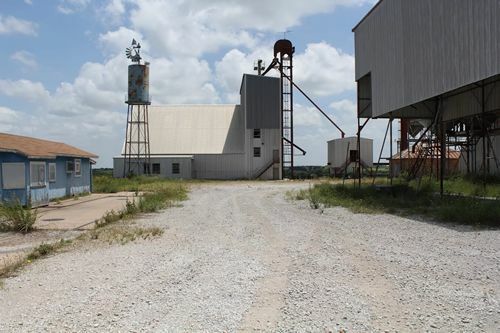 If you went west from the school house to the first corner and turned north, Uncle Ben Keith's place would be on your left and B. Ray McCorkle's place would be on your right. 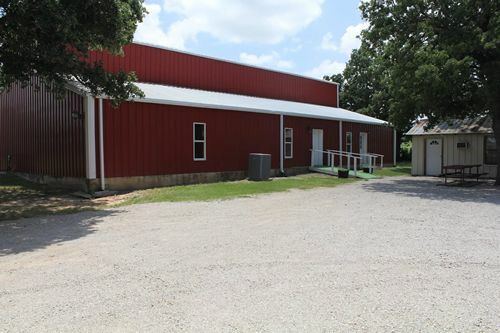 He had planted several acres in pecans and fruit trees. Mr McCorkle was superintendent of the Beattie School for a good many years and then he served as County Supertendant for a while. 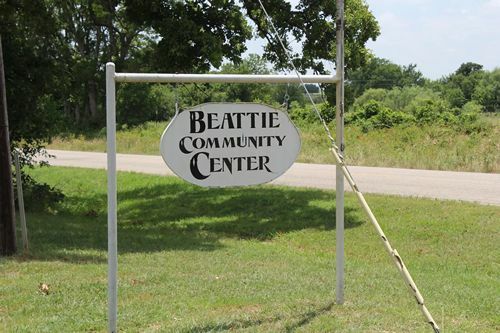 There are a lot of incidents and interesting stories and events that need to be recorded about Beattie. They need to be written and kept for our descendants and future generations. Some of them are tragic and sad, others are comical and some are unbelievable. I will try to record some of them as I remember them or as they were told to me. My Father-in-law, Jimmy Wright, told me that in the early 1930's he raised several acres of Irish potatoes and sweet potatoes. He built two "tatter houses" or cellars to cure and store the potatoes in. After the potatoes were "cured out" and ready for market, he would load up his old "bob-tailed" truck and haul them to West Texas and peddle them out to grocery stores. He had a sign painted on each door of the truck which read " J.N. WRIGHT -- POTATO GROWER-- BEATTIE, TEX." 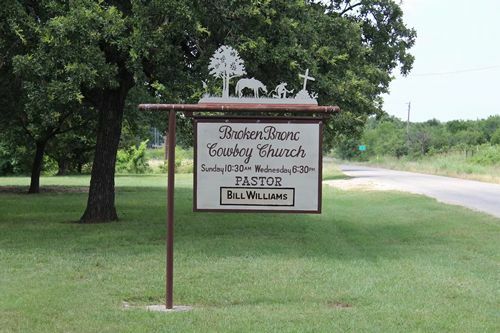 Mr. Wright told of a time when he was out in West Texas and a total stranger walked up and read the sign and he said. 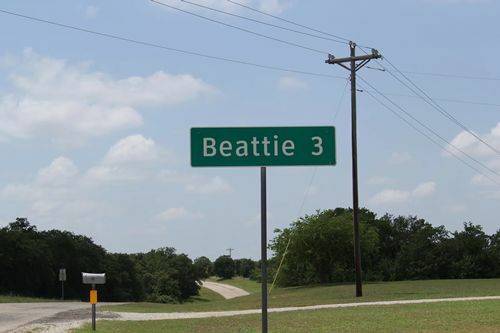 "Beattie, Texas, I was there once and I'll tell you what I saw" He went on to say that he had stopped at Beattie for the first time in his life and was sitting in his touring car enjoying a cold drink. He said that a man came out of a filling station and fell down on his all fours in some sand. He began to bellow like a bull and paw up sand into the air. About this time a fellow came running out of the barbershop waving his hair drop cloth in that "bull's" face and yelling "Ole, Toro". About that time a man came running out of the blacksmith shop and jumped a straddle of the "bull". He yelled, "Yahoo, By Grabs" while another bystander shouted "Ride 'em Cowboy!" Jim Wright said that he could tell you who these characters were and he named. Dimmet Wright, Dan Bingham and John Kelley. Uncle John Kelley was the "Village Blacksmith" at Beattie for many years. On a clear morning you could hear from miles away, the ring of the hammer on the anvil as he beat out and sharpened the plow sweeps for the local farmers. If you were a little closer you could hear him whistle and warble the tune, "Listen to the Mocking Bird". I never had the pleasure of hearing him play the fiddle, but I have been told that he was an outstanding fiddle player. Uncle John was an avid fisherman and it was said of him that he would go to the creek fishing and if they were not biting he would stay with them until they did even if it took several days. "Slick" Robertson told me one time that he went by the blacksmith shop and said,"Uncle John, Let's go fishing." Uncle John looked around him at all the plow sweeps that needed to be sharpened and he said, "There is about a hundred reasons why I shouldn't go fishing, but right now I can't think of a one of them." "Give me five minutes to get my tackle and I'll give you back three of them." In the early days of the automobile, Zuleam's grandpa, Dimmet Wright, owned what was later called an antique. It was an old two cylinder Maxwell. The engine sat cross ways, that is, it was parallel to the axles kind of like some of the modern front end drive vehicles. The Maxwell was not a front-end drive, but it used chains like a motorcycle. It had a large visible flywheel on the side. It had a drip lubricating system and carbide lights. When it ran it sounded like a "Popping Johnny" or an old two cylinder John Deere. Dimmet Wright also ran one of the early "Filling stations" in Beattie. The story goes that a lady was driving a T Model Ford through Beattie and she stopped at the service station. She ask Mr. Wright if he had a Rest Room there. He said, "No, but I have a chair that I can put under that tree and you can rest there." Zuleam had a lot of cousins in and around Beattie. She still has dozens of them of varying degrees, that is first, second, third and fourth and ever more than that if you count that far. Two cousins that grew up with her were Boyce and Neilly Bingham. Boyce was actually a second cousin, being Zuleam's great Uncle Plez's son. He was quite a character and we will be writing more about him later. Neilly was double kin in that he was a first cousin and a third cousin. His mother was Aunt "Tom", (Thelma), Zuleam's daddy's sister. His father was Uncle Emmit Bingham, a first cousin to Zuleam's mother, Leona (Bingham) Wright. These two boys spent a lot of time hanging around the Beattie Stores and visiting Zuleam's place where a lot of other kids hung out. Boyce and Neilly pulled some pretty good ones. In some ways Neilly was a little timid and Boyce delighted in embarrassing him. On one occasion there was a girl by the name of Ann Wall visiting with the John Andress family in Beattie. I think that she was from Brownwood. Boyce and Neilly were teen age boys and the girl, Ann, was about their age and they thought she was very pretty. The two boys were at the Beattie Store when they decided that they would walk up to the Andress home and "call on" Ann and visit with her. 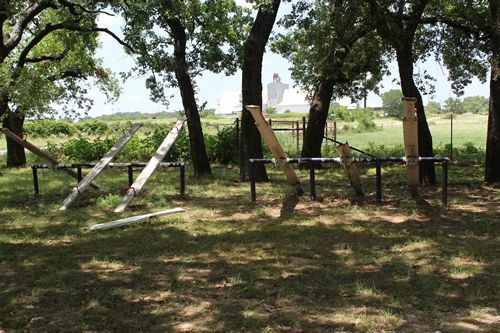 The boys walked up to the Andress place and went through the yard gate. Instead of going to the door and knocking on it, they stood in the front yard and yelled, "Hello !" as people some times did in those days. It was after dark and what happened next surprised several people. The boys didn't know that Ann's father was there. He came to the door but when Boyce saw him he ducked under the front porch and left Neilly standing all alone in the front yard. Neilly quickly sized up the situation, whirled about and ran out the front gate and all the way to the store. Boyce remained quietly under the porch until things cooled down, then he sneaked out and made his way quietly to the store. During the late thirties and early forties times were kind of "tuff" around Beattie. We would work hard all day from sunup until sundown for one dollar in American money. Our work clothes were worn and raggedy and patched and worn out and re-patched again. Most all boys had started smoking by the time they reached their upper teens. Bull Durham smoking tobacco cost a nickel a sack or six sacks for a quarter. The boys all carried a pocket full of kitchen matches from the family kitchen. Bull Durham tobacco took a lot of matches because as soon as you quit puffing the hand rolled cigarette would go out and had to be lit again. One of the worst hazards of carrying matches in your pocket was that occasionally they would rub together and ignite in your pocket. You would have to run your hand into the pocket and pull out the flaming, smoking matches. Besides your burned hand and burned out pocket you smelled strongly of burning sulfur for the rest of the day. On one occasion, I was eating lunch (we called it dinner) with the Jimmy Wright family. I was a regular diner there and I sat at the table in a rope bottom chair. ( Years earlier it was a cane bottom chair but when the cane wore out it would be replaced with a crisscross of small rope.) As I sat in this chair with my raggedy pants some times the rope and the raveling didn't match up properly. Boyce Bingham came in the house before I finished eating. He squatted down behind me and leaned back against the wall and rolled himself a Bull Durham cigarette. When he lit the cigarette with a kitchen match he noticed a raveling hanging down from the seat of my breeches through the bottom of that rope bottom chair. Before he extinguished the match, he touched it to the raveling. The flame went right strait up and so did I. I yelled and stood up so fast, I tipped the table over on those across from me. They kept the table from going completely over but it cleared every thing off the table. I am glad that we were about through eating any way. This was really embarrassing to me but every body else in the house just roared with laughter. As I begin to think of it now I believe that Boyce was just plain mean. He and Neilly were sitting in the Beattie store enjoying soft drinks. Neilly had a milk chocolate drink setting there and Boyce noticed a package of Ex-Lax on the shelf near by. He broke into small pieces and dropped them into the milk chocolate bottle. I don't think that he ever knew that the drink was spiked but he didn't show up at the store for the next two or three days. He later said that he thought he had a bug. Bobby Ferguson was one of the fastest runners that ever grew up in Beattie. His parents and several brothers and sisters lived in the Uncle John Kelley house in down town Beattie for years. Hubert and Harold Kelly were school teachers and lived there part time, especially during the summer. Money was scarce in those days and teachers seemed to have more than anyone, or so it seemed to Bobby. He was constantly begging Uncle Hubert or Harold for a nickel to buy a coke or a bar of candy. When they were not there, Bobby had to depend on his ingenuity to raise a little money. When he heard a hen cackle at his mother's chicken house, he would run like lightening and grab the egg and race down to the store where he would trade it for a penny piece of candy. Some body said that he visited his neighbors hen house , but I am not sure of this. Eggs did bring twelve cents a dozen at that time. I have never seen any one move any faster that Bobby with an egg in his hand. Bobby was helping his dad, Sid Ferguson, clean up the cemetery at Concord. They came up on an open grave where the casket was showing. Sid suspected that grave robbers had dug up the grave. He told Bobby to run back to the Beattie Store and phone the sheriff. It was about two miles to Beattie and Bobby made it in just under eight minutes. We didn't have an official timer there or he would have been the first to break the four minute mile. It turned out that two workers were exhuming the body on a court order and they were waiting nearby for a hearse to come pick up the body.